John Wesley Callison (March 12, 1939 – October 12, 2006) was an American professional baseball player. He played in Major League Baseball (MLB) for 16 seasons and is best known for his years with the Philadelphia Phillies as a right fielder from 1960 through 1969. He was an All-Star for three seasons and four All-Star games. He led the National League (NL) in triples twice and doubles once, and gained his greatest prominence in the 1964 season in which he was named the MVP of the All-Star Game and he was the runner-up for the NL Most Valuable Player Award. He also led the NL in outfield assists four consecutive times and in double plays once, and ended his career among the top five Phillies in home runs (185) and triples (84). In 1959, Callison split time between Chicago and Indianapolis. He was not on the World Series roster when the White Sox lost the series to the Los Angeles Dodgers, and in December he was traded to the Phillies for third baseman Gene Freese, who would spend just one year in Chicago and last played regularly in 1961 (despite staying in the majors until 1966). 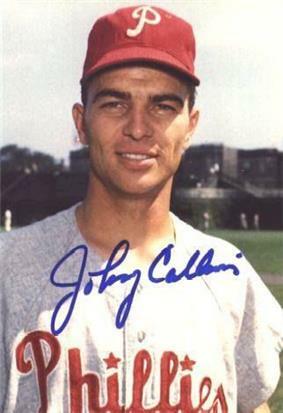 Callison became a fan favorite in Philadelphia; Supreme Court Justice and lifelong Phillies fan Samuel Alito recalls he "adopted Johnny Callison out there in right field" as a boy. Over the next decade, Callison would be named to the NL All-Star roster three times (1962, 64-65). In 1962, he batted an even .300, the only time he would reach that mark, and led the NL with 10 triples. On June 27, 1963, he hit for the cycle against the Pittsburgh Pirates. On July 23, Cal Koonce. There was one out and no score by either team at the time. European and U.S. viewers also saw the previous play, a flyout to Altman by Phillies' leadoff hitter Tony Taylor. It was the first and, as of 2012, the only segment of an American sporting event to be televised live by ABC, CBS and NBC simultaneously. The Phillies went on to win the game 5-3. ^ Walker, Ben (March 10, 2007). "Supreme Court justice trades robe for jersey". Associated Press. ^ George Vecsey (27 September 2011). "Recalling a Phillies Fall; Share Your Pennant Race Memories". New York Times. Retrieved 26 September 2011. ^ Paul Lukas (July 12, 2013) "http://espn.go.com/blog/sweetspot/post/_/id/38106/uni-watch-all-star-helmet-mix-ups"
Steve Wulf (07/11/13). "A Hard-Knock Life". ESPN. Retrieved August 28, 2013. Biographical article on Callison.